Don’t let Lucky’s cape fool you, this fox is no superhero. Don’t expect any evil-crushing feats of strength from the woodland critter; Lucky can jump over narrow gaps and spin his tail to knock away enemies, but that’s where his talents begin and end. 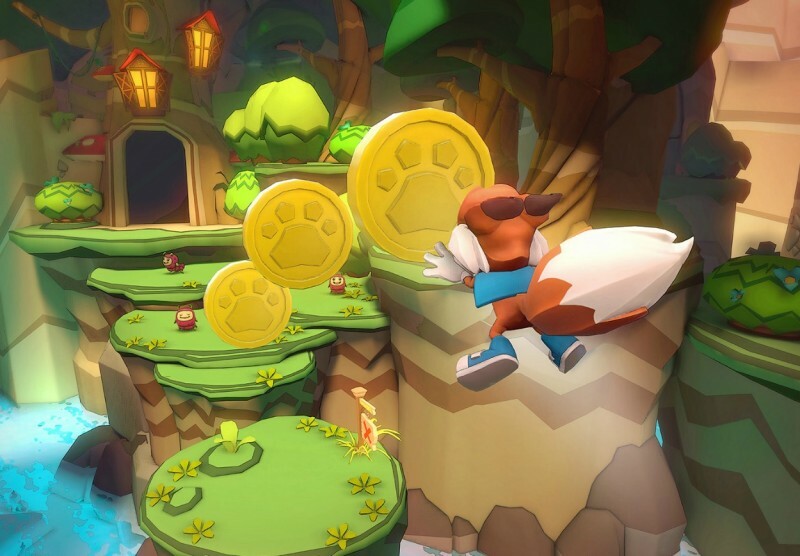 Simplicity lords over most of Lucky’s Tale, leading to an adventure that rarely gets the blood pumping. One of Lucky’s Tales’ biggest thrills comes in the opening story sequence, in which a giant, tentacled beast reaches into Lucky’s home to kidnap his friend Piggy. The size of the beast is impressive – a nice showpiece that demonstrates how scale can be more intimidating in virtual reality. This villain reveal is a promising first step, but it ends up being the most exotic and creative element in the entire journey. I wouldn’t say Lucky’s adventure goes downhill from here, but the gameplay rarely delivers that initial “wow” factor. 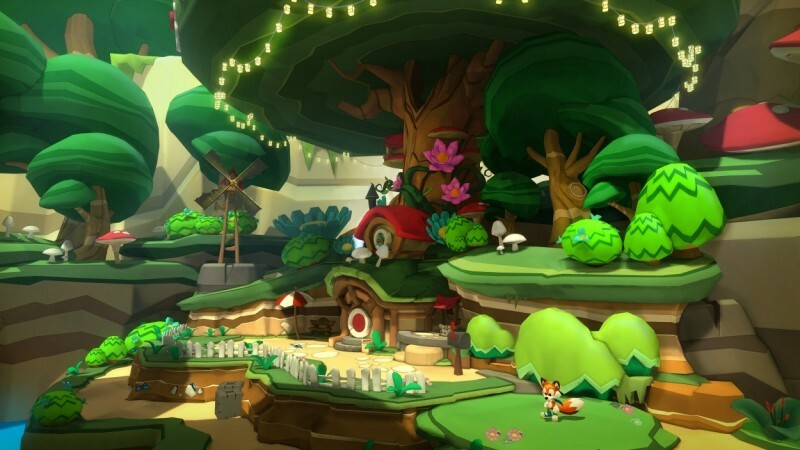 The world Lucky explores is ordinary in design, consisting of giant mushrooms, swinging logs, and overly happy caterpillars on the prowl. As colorful as these sights are, nothing steals the eye. I got a kick out of turning around in my chair to see how high I climbed, and moving my head forward to get a closer look at an enemy, but the landscape itself is unremarkable. Leaping across lily pads and tail-whacking enemies becomes the routine for most of the stages, and the occasional boss fights and bomb-throwing sequences aren’t enough to spice up the action. Developer Playful Corp rarely detours from the basics. By the third level, I felt the action was in desperate need of variety. 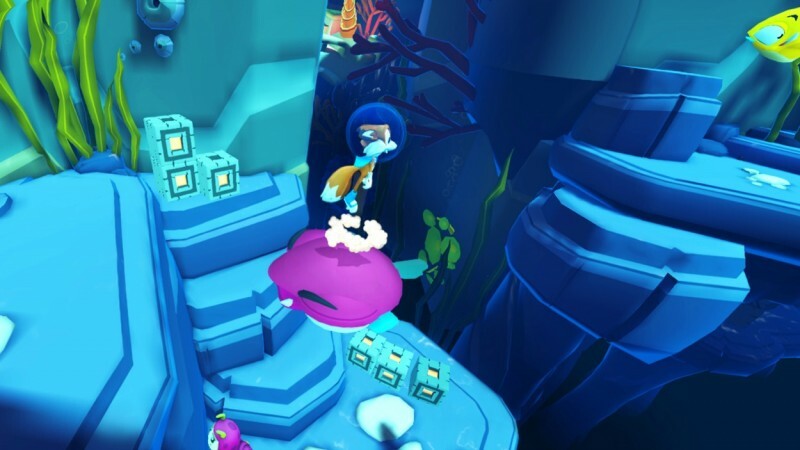 Lucky’s Tales’ gameplay smacks of proof-of-concept, and you can almost sense the developers tiptoeing through the uncharted virtual-reality waters. The training wheels are loosened in the final two stages, where spinning platforms require quicker reflexes, but the majority of the game is played too safe. Part of the problem is Playful Corp’s decision to gate progress, which artificially expands the length of the game. In order to reach new levels, Lucky must first collect a specific number of Paws. A Paw is rewarded for finishing a level, but that isn’t always enough. To earn more Paws, the player must reenter the levels to complete time trials or red-coin challenges. If the level was boring the first time (which many of them are), replaying it feels like a chore. And if you happen to die during either of these missions, there are no checkpoints. You’re warped back to the beginning and must retrace your steps. For the red-coin challenges specifically, if you miss a coin, which is easy to do, you warp back to the beginning and must look for that needle in the haystack as you venture through the environment again. 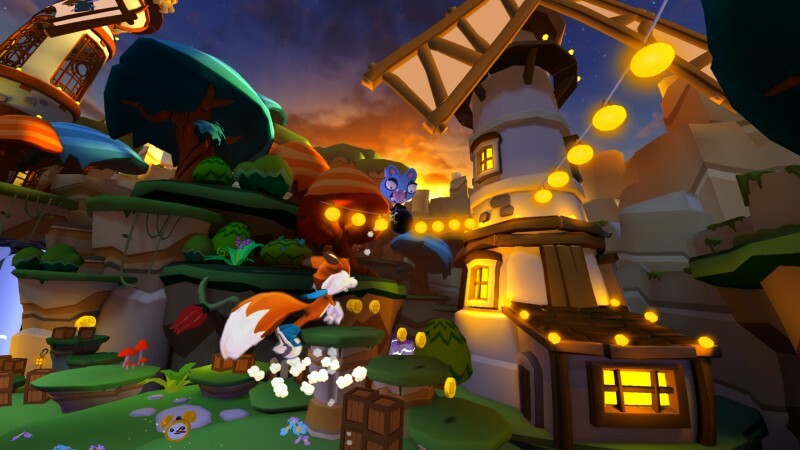 Even with the gating in place, Lucky’s Tale is short. 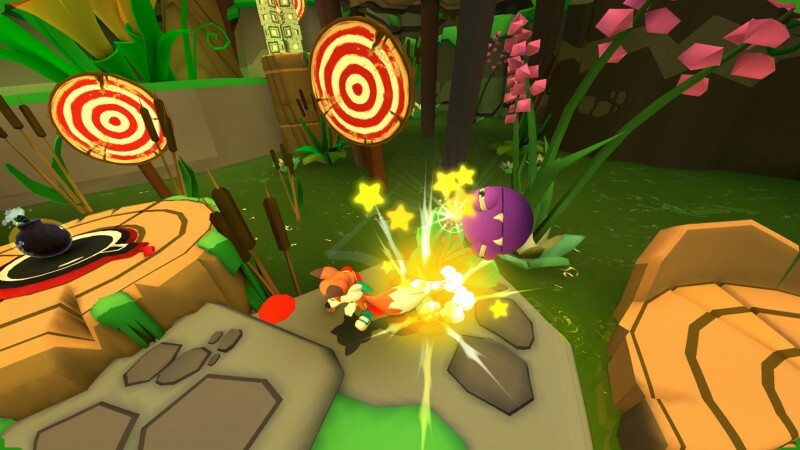 Playful Corp can be commended for adopting a classic genre to VR, as well as releasing a game with a high level of polish, but thrills are fleeting and the fun rarely surfaces as Lucky hunts for his dear pig friend.